Thomas Ikimi's independent drama is as of this writing the most obscure credit on Elba's post-The Wire résumé, but I suspect that as the years pass it will be looked back on as a touchstone work for the very reasons why it sadly was denied wide theatrical play when it hit cinemas in fall 2010. Set largely in a single location--a run-down Brooklyn hotel room--on a solitary character, former Black Ops operative Malcolm Gray, as he gradually, ironically loses himself as he attempts to find the truth behind a mission gone awry, it's the type of dark, cerebral, experimental exercise that is alienating to many a moviegoer (and, most certainly, many a Hollywood executive) at its very core. So it's up to the film's director and its star (who also executive produced) to create a connection with the audience, with the greatest burden falling upon Elba, who shoulders the responsibility of not only creating a compelling center but in making a feature-length internal exploration into an involving one to the external viewer. 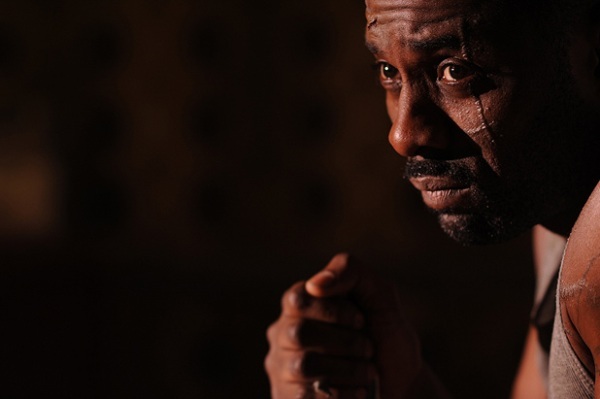 That the end product ends up so harrowing is due to Elba's naked emotional fearlessness from first minute to the last--and the key to his superb portrayal lies not in the broader strokes of madness and rage, but the very real, very raw pain and vulnerability that consistently boils underneath. It is the attention to that detail that makes the film not only chilling by its conclusion, but truly tragic.